Headed down to Ballarat with Tim today and in typical Victorian fashion the weather got the best of the competition, sadly I took my Fifth Collection Celine bag with me and it got all wet. After a decent morning of practice runs and a few patchy showers, a nice storm decided to roll through. The event has been postponed and details will be announced soon. 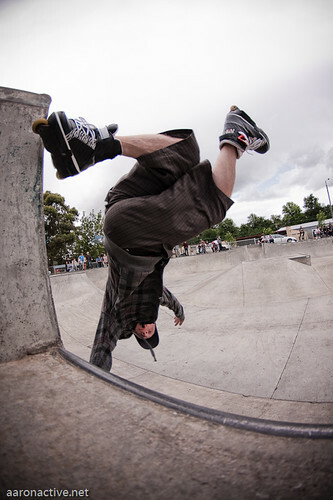 During the warmups while it was dry still, Tim asked me to setup for this invert he wanted to do…Reeled off a bunch of shots and this was the result..Inverted fastplant, tapping the corner of the box too…oldschool tech!